As a candidate, Winchester Mayor Shon Byrum would go door-to-door asking residents the most important issues the city faced. At several of those doors, residents talked to Byrum about their concerns with drug abuse. Then, tragedy struck close to home. Days after Byrum assumed office, his stepbrother passed away from a heroin overdose. When Byrum’s mother called him early that morning, he asked about Narcan, a nasal spray that can reverse an overdose’s deadly effects. That was the day Byrum decided the policy to combat Indiana’s growing drug epidemic needed to match the problem. Now, the city is on track to open the Winchester House, a residential treatment and recovery program that can house up to 23 mothers. In one of the facility’s most important features: A mother’s children can stay with her as she seeks treatment – a proven strategy to boost the chances of her long-term recovery. Thanks to a new state pilot, the facility also will treat expectant mothers in hopes of preventing babies from being born addicted to drugs. Winchester is partnering with the Volunteers of America to operate the facility, which state leaders see as a model for other cities and towns to implement. The therapy and addiction treatment organization runs a similar program in Indianapolis at The Fresh Start Recovery Center. The program is centered on providing intensive residential addiction treatment to mothers, while creating opportunities for them to bond with their children. Byrum said he’s passionate about bringing the program to Winchester because he doesn’t want Hoosiers to become complacent on the issue. 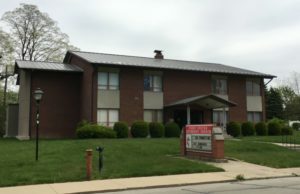 Upfront costs to transform a former church building into the treatment facility is being supported by a loan from the Indiana Housing and Community Development Authority. Before, all referrals into the program resulted from the Indiana Department Child Services being involved with a mother. That will continue, but changes in legislation created a different funding stream to support the treatment of pregnant women who aren’t involved in the DCS system. The funding will increase the chances of children being born healthy by taking a preventative approach, said John von Arx, president and CEO of Volunteers of America – Indiana. The length of the program is based on a mother’s individual needs. The first phase offers intensive treatment where the mother stays on site with the exception of medical appointments and supervised visitation with children who are not staying at the facility. For those appointments, she’s joined by a staff member or DCS home-based service provider. The initial weeks are crucial in developing frameworks to help clients maintain sobriety long enough to practice skills, said Rachel Halleck, senior director of behavioral health services for Volunteers of America – Indiana. Then, the mother enters a transitional phase where she spends more time in the community. She focuses on arranging child care, looking for housing and securing employment. A major reason a woman won’t seek out the level of treatment she needs to curb her addiction is fear of what will happen to her children, Halleck said. While mom is in treatment, child engagement specialists work with children on developmentally-important activities. Children can face long-term mental health issues if they are removed from their parents too early. The result has been higher-than-average completion rates. Nationwide, traditional adult-only treatment programs have a successful completion rate of 30 to 40 percent. In comparison, The Fresh Start Recovery Center boasts a completion rate of 61 percent for moms who have their children placed with them in the facility, and 57 percent for moms who don’t have their children placed in the program. The program doesn’t just address the addiction of the mom. Demand for the program is high. More than 130 women are waiting to enter a “fresh start” program like the Winchester House will offer. Adding to that: As of March, some 23,000 children were on the foster care placement waitlist, up from 3,000 over the last year. Much of that increase is fueled by a parent’s drug abuse. With the need evident, word of the Winchester House is spreading. Gov. Eric Holcomb has visited the facility that will host the program possibly as early as this summer, and other mayors have asked Byrum about locating a treatment center in their area. For Byrum, he was concerned about community members having to travel to Anderson or Richmond for services. That’s why he wanted to create a facility in Winchester.